A tropical storm expected to bring heavy rain and wind to Hawaii this week shouldn't significantly affect the state's primary election based on current weather forecasts. Associated Press. Hurricane Iselle weakened slightly and Tropical Storm Julio maintained its intensity as both storms continued on a path toward Hawaii. Star-Advertiser. 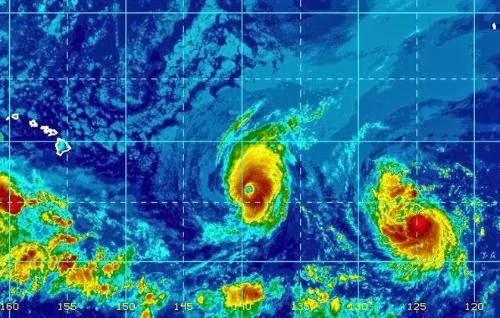 Government officials kicked storm planning into a higher gear Monday as Hurricane Iselle appeared to be taking aim at the Hawaiian Islands and another powerful storm was following in its tracks. Star-Advertiser. Nineteen Hawaii super PACs have spent more than $1 million in the current election season to sway voters and influence the state’s political atmosphere, according to the most recent campaign spending commission data. Civil Beat. A nonpartisan candidate for the U.S. Senate is suing Hawaii television stations KHNL and KGMB for not allowing her to appear in a televised debate. Joy Allison of Waikoloa filed the lawsuit in U.S. District Court on Friday. Associated Press. With 5 days to go before the primary election, our Hawaii News Now/Star Advertiser Hawaii poll shows a dead heat between Shan Tsutsui and Clayton Hee in the Lieutenant Governor's race. The race for the Democratic Party's nomination to be the state's next lieutenant governor is in a statistical dead heat, and could come down to last-minute appeals from the campaigns to swing a large number of undecided voters, according to one analyst. Star-Advertiser. GMO Issue Spurs Candidates to Seek Election, But It’s Ugly Out There. Hawaii political observers are watching bellwether races on Kauai, Maui and the Big Island. Sentiments run high on both sides, and sometimes the campaigns get edgy. Civil Beat. A majority of voters favors a constitutional amendment on the November ballot that would allow public money to be spent on private preschool, according to a new Hawaii Poll, but the degree of support has weakened since February. Star-Advertiser. The Department of Veterans Affairs continues to whittle down the wait times for patients in the military medical system in Hawaii and other parts of the Pacific. Star-Advertiser. Hawaii's tourism industry is in a good position to match or break visitor arrival and spending records this year after gains in June and an expectation that airline capacity serving the state from North America will expand over the remainder of the year. Star-Advertiser. State officials announced the successful sale of nearly $164 million in Highway Revenue Bonds, with an estimated $120 million to fund various highway projects, and more than $65 million allocated to refinance existing bonds for interest savings. Maui Now. Pesky Drones Snap Photos on Private Property. Should a small model airplane with a camera on it be allowed to fly into your space and take pictures of you? Civil Beat. Hawaii's first plan to address Alzheimer's disease and dementia forecasts effective prevention of Alz­hei­mer's by 2025 while calling on volunteer caregivers, health care professionals and others in the near term to step up training in the complicated issues tied to both conditions. Star-Advertiser. State roundup for August 5. Associated Press. A new proposal would allow residential owner-occupants on Oahu to petition the city for one-time property tax compromise bills if they got shoved into the new Residential A tax class, requiring them to pay at a much higher rate. Star-Advertiser. A source within the State Senate has informed the Independent that State Senator Rosalyn Baker is the “chief legislative supporter of [Dr. Michele] Carbone,” the Director of the University of Hawaiʻi Cancer Center (UHCC) who has come under fire for his mismanagement of the center and for his unheard of amount of ethical and academic violations against his own researchers. Hawaii Independent. The fierce elements brought on by hurricanes and tropical storms are a big threat to people who live in the elements. The efforts to warn and find homeless shelter is already underway. KITV4. A Honolulu insurance agent has purchased nearly 30,000 square feet of vacant, foreclosed property in Kailua in Windward Oahu for about $2 million that could be redeveloped as apartments, retail, offices or assisted-living facilities. Pacific Business News. Incumbents are flexing their financial muscles in the Big Island state House and Senate races ahead of the primary election Saturday. With a few exceptions, those running for re-election are outspending and out-fundraising their opponents by large margins. Tribune-Herald. Farmers taking advantage of county property tax breaks could soon be required to dedicate the land to farming for at least three years to qualify. West Hawaii Today. The Center for Food Safety and Big Island organic farmers Rachel Laderman, Nancy Redfeather and Marilyn Howe are seeking to help Hawaii County defend its law restricting the use of genetically modified crops. Tribune-Herald. Two Hawaii Island telescopes captured images of several eruptions that are changing scientists’ understanding of volcanic activity on Io, one of Jupiter’s moons. West Hawaii Today. Five candidates are trying to unseat Mayor Alan Arakawa, a Hail Mary proposition that even Maui's most established politicians decided to take a pass on this year. Maui News. Maui state Senate candidates are debating how to help local public hospitals amid news the Maui Memorial Medical Center will shut down its adolescent behavioral health unit to save money. Associated Press. Life on Maui has changed, at least when it comes to trash collection. And you can blame it on budget cuts. Money problems are squeezing everything from trash pickups to hours of operation at county landfills. Hawaii Public Radio. Jay Furfaro has seen a number of issues come across his desk during the nearly 12 consecutive years that he has been on the Kauai County Council. Garden Island. Hawaii’s tourism economy is on pace with last year’s record-breaking year in spending and arrivals, but Kauai saw fewer visitors and spending in June. Garden Island.